In last month’s blog, I began my examination of whether Luke, Leia, and friends actually had a plan to rescue Han from Jabba’s palace in Return of the Jedi or whether they made things up as they went along. That post ended after most of the major players arrived at the palace, Leia unfroze Han, and Leia became Jabba’s prisoner. This blog begins with the arrival of Luke Skywalker. Before continuing the discussion of the plan, let’s first review the events at Jabba’s palace occurring after his arrival. Luke arrives under his black cloak with the hood up. The Gamorrean guards block his path and deny him entry. In response, Luke calmly uses the Force and chokes both of them. With that obstacle removed, Luke next encounters Jabba’s majordomo, Bib Fortuna, just outside of Jabba’s main audience chamber. Jabba ordered his minions to deny Luke entry, and Bib acts in compliance with that order until Luke uses Force persuasion and changes his mind. Unfortunately for Luke, the mind trick doesn’t work on Jabba. Therefore, Luke suggests Jabba has two options. Either Jabba can turn over Han Solo and his friends and profit, or he can be destroyed. Jabba refuses any bargain and states he’ll enjoy watching Luke die. At that moment, Jedi grabs a blaster, points at a Jabba, and then falls into the Rancor pit after Jabba opened the trap door below him. Luke slays the Rancor, much to Jabba’s surprise and chagrin. Then Luke, Han, and Chewbacca appear before Jabba and Jabba sentences them to death at the belly of the Sarlacc. With this summary concluded, it is fair to ask what, if anything, these events say about the plan, or lack thereof, to rescue Han Solo. Fans of Return of the Jedi already know Luke didn’t have access to his lightsaber. That was safely hidden inside Artoo, who already infiltrated the palace. Evidence suggests Luke didn’t believe the negotiations would work and that his lightsaber wouldn’t do him much good inside the audience chamber. Without diving too far into speculation, that may have been due to the sheer number of Jabba’s minions in one place, the close confines of combat there, and the possibility of putting Leia, Threepio, and others in immediate harm. 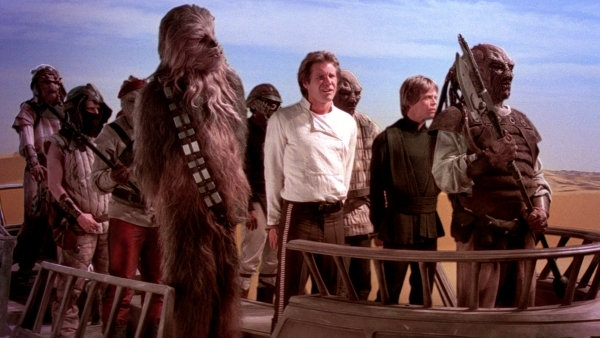 However, once he, Han, and Chewbacca are aboard the desert skiff, the situation changes. For one, nobody is looking for his lightsaber. Artoo is already in position on the sail barge to deliver it to him. In addition, while Han continues to recover from his carbon freezing sickness, Chewbacca and Lando are nearby for protection. Plus, Leia is in Jabba’s chamber on the sail barge. From there she can, and did, disable the view port and attack Jabba himself. Luke and Leia also have the bonus benefit of a method of escape. Once everyone is safe and they destroy Jabba’s sail barge, they have a way out of the desert. Well Executed Plan or Improvisation? It is impossible to say for certain that everything went according to plan. Unlike a movie such as Ocean’s 11, the protagonists don’t outline their plan is through some clever dialogue designed to camouflage exposition. In addition, if this was a plan, the execution leaves audiences with an initial impression that things went terribly wrong. Did Leia really mean to reveal herself to Jabba? Did Luke really intend to fight the rancor? As disgusting as it sounds, my last blog at least suggests that Leia’s actions were part of the plan. But, what about Luke’s battle with the rancor? To address that question, consider his actions just prior to falling into the rancor pit. He used the force and drew a gun on Jabba. Does that seem like the conduct of a Jedi? As Yoda told Luke in The Empire Strikes Back, a Jedi uses the Force for protection and defense, never for attack. It seems likely with this admonition in mind, Luke was simply trying to provoke Jabba. He might not have anticipated falling into the rancor pit, but perhaps he believed he too would be imprisoned in the dungeon with Han and Chewbacca. From there, Artoo might have delivered his lightsaber, or Lando might have freed them. There are plenty of possibilities, but it is unnecessary to tread that close to the line of Coffee with Kenobi’s no speculation policy. Many of the actions taken by the rebels suggest a plan. Lando infiltrated Jabba’s palace in disguise. Leia posed as a bounty hunter and turned in Chewbacca. Luke stashed his lightsaber in Artoo. Later, Chewbacca mentioned parts of a plan to Han Solo, although the audience only understood part of what he said. Clearly there was a plan at work. Whatever the plan was, it wasn’t executed flawlessly. Such things rarely go perfectly. Therefore, Luke and friends improvised where necessary. Prior to the infiltration of Jabba’s palace, the Star Wars movies seldom featured well executed plans by Luke, Han, and Leia. For instance, Luke and Obi-Wan chartered a flight to Alderaan in A New Hope. It turned into a rescue attempt. Even then, Leia noted they only had half a plan. Also consider the evacuation of Hoth in The Empire Strikes Back. The Rebellion had a plan for escaping the Empire. Han, Leia, Chewbacca, and Threepio simply fled and improvised all along the way. Han’s rescue from Jabba’s palace was really the first well designed and executed plan they had. If you don’t mind my throwing my two cents in, I do believe the Rebels had the nucleus of a plan, but with so many unknown variables, I would imagine they all knew they’d be flying by the collective seat of their pants once the plan’s execution was put into place (especially after Leia’s and Chewie’s arrival). I do not think Leia’s identity revelation was part of the plan. Examine the look on her face when Jabba’s deep, throaty laugh rings out. And Luke, a bit naïve with his new Jedi powers, probably expected Jabba to “fall victim” to Luke’s powers. When it was clear Jabba couldn’t be swayed — via Jedi powers or Luke’s frankness — Luke went on the DEFENSIVE [grabbing the blaster], not the offensive. [Remember, Luke did not have access to his lightsaber at that moment.] At least that’s my opinion. Whether Luke had any intention of slaying the rancor is … well, anyone’s guess. I think he was more concerned about escape [he made every effort to flee the rancor pit rather than kill the beast], but when all his efforts failed, he did the only thing he could — he slew the dragon … er, rancor.